Preheat oven to 450° F. In a small mixing bowl, combine 1 pouch of pizza sauce, ricotta cheese, mozzarella cheese, 1/2 cup of Parmesan, pepperoni slices, red pepper and black pepper until well blended. Transfer the mixture to a small, shallow baking dish; top with remaining sauce pouch, spreading evenly; and sprinkle with remaining 1/4 cup of Parmesan cheese. Bake alongside the crusts for 10 – 12 minutes until dip is bubbly and crusts are crisp. 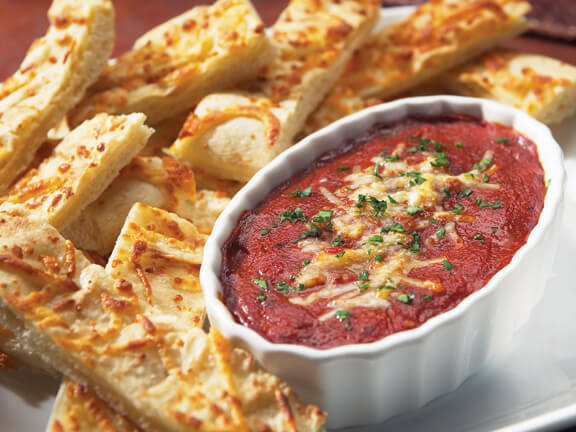 Cut crusts into 1"x 4" strips and serve alongside dip.